Download here the full brochure of the Graphite Electrodes Division. Trasteel International has a partnership with an ISO9001:2008 certified Chinese Graphite Electrodes Producer. The plant facilities use modern technology and equipment, with lengthwise graphitization furnaces to produce UHP quality electrodes with diameter’s size ranging from 200 to 700mm. Trasteel International’s Graphite Electrodes have been continuously improved and are produced with top quality needle coke (supplied by Conoco Phillips and Mitsubishi Chemicals) and pitch (supplied by Rütgers GmbH). All products are subject to rigorous testing and control procedures in order to guarantee a high and consistent quality to its end users. 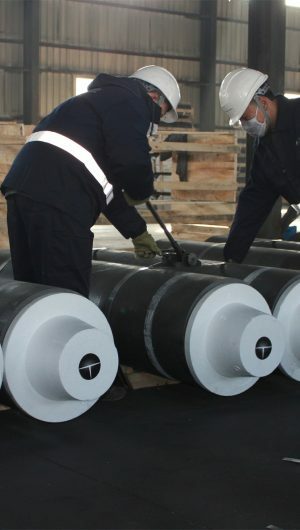 The technical staff follows step by step the manufacturing of the graphite electrodes. Trasteel International has a production line dedicated only to its materials, on which it has complete quality control: from raw materials choice, to the baking and the graphitization process, ending with the machining of the final products. Trasteel International’s Graphite Electrodes have the proven ability to maximize steel capacity while reducing power and production costs. The Company supplies major steelmaking groups on a worldwide basis, providing all the necessary on-site technical assistance to supervise and guarantee the best performance of the products. Trasteel International’s technicians have the capability not only to maximize the performance of graphite electrodes, but also to help improving the steelmaking process as well as reducing transformation costs. In order to provide quick and efficient assistance and quick deliveries, the Company has offices and warehouses located in strategical areas ensuring constant supply at all times.